According to the City of Cambridge website the project to memorialize Hall was formally launched this past April 2008: "An effort has begun to place a memorial to Prince Hall, the 18th Century Patriot and Civil Rights Advocate, on the historic Cambridge Common. A committee formed by Mayor E. Denise Simmons has gained preliminary approval from the Cambridge Historic Commission to design and place the memorial on the Common’s rotunda – near the George Washington Memorial." Cambridge Common is perhaps now best remembered as the place where George Washington took command of the Continental army on July 3, 1775 - something that was not especially remarkable at the time. I should add that this did not take place under the so-called Washington Elm, a tree that actually existed, but which went from being an ordinary elm tree to iconic symbol (see this postcard) only later when stories were invented, putting Washington directly under that tree as he took command of the Continental army. You can read a bit more about this legend at the Cambridge Historical Commission's FAQ page. Mythology and inaccuracy have dogged historians interested in learning more about Prince Hall as well. Finding accurate biographical information about Prince Hall isn't easy. It is mostly complicated by the fact that William Grimshaw's 1903 book Official History of Freemasonry Among the Colored People in North America [Call no. : 90.G86 1969] contained a number of factual errors, but which was used as a definitive source, thus spreading the inaccuracies much further beyond this one book. The Phylaxis Society - "an international organization of Prince Hall Freemasons dedicated to studying the life of Prince Hall and researching the history of Prince Hall Freemasonry" - has done an excellent job trying to get at the factual truths of Prince Hall's life, while at the same time refuting the many errors found in Grimshaw's book. Their on-going search for the facts about Prince Hall's life is called the Grimshaw Offensive. Check it out - and learn more about the life of Prince Hall. In addition, we also have a nearly complete run of The Phylaxis Society's magazine, The Phylaxis, which has been published since 1974, as well a number of annual proceedings from various Prince Hall Masonic bodies. That said, we're always interested in building on our collection of Prince Hall Freemasonry here - if you've got something that you'd like to donate, we'd love to consider your donation. Today's picture, which was taken by yours truly on a recent trip to Cambridge Common, shows a detail of a monument that was erected in 1950 and which is located on the Common. The monument commemorates George Washington assuming command of the Continental forces on July 3, 1775. 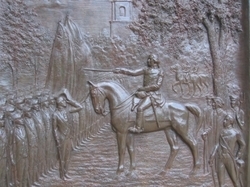 The detail shown here is from a bas-relief by Leonard Craske that's attached to a larger stone marker. You can see the so-called "Washington elm" depicted on the right-hand side of the scene above; and you can see here that the decision to include this mythological elm in the image above was controversial at the time that the memorial was being designed. The Prince Hall Monument was designed to be a teaching tool. Initial questions were about the numbers of African Americans who fought with George Washington in the Revolutionary Army and about the abolition of slavery in the north. Research by prominent historians and a joint resolution of our 98th Congress, Public Law 98-245 gave us some answers. From 17766 to 1783 more than 5,000 black men, by fighting to free this nation, freed themselves. Thus it was declared that the five black marble slabs of he monument, mined in Africa, would represent those 5,000 and all the other Black Patriots of the founding period of our nation.